An Arab-American psychologist speaks out on Al Jazeera TV, clip translated by the Middle East Media Research Institute (MEMRI). CNN host Glenn Beck presents Exposed: The Extremist Agenda. Click below to watch. And if you don't remember who pays for the propogation of that agenda, click here. In order to promote suicide bombing and other terrorism, the [Iranian] regime's theoreticians have utilized religion both to recruit suicide bombers and to justify their actions. 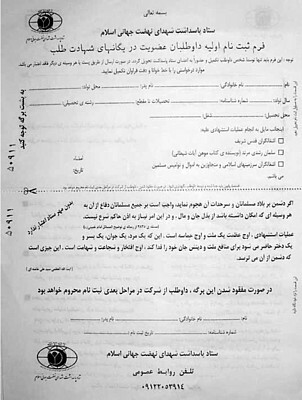 But as some factions within the Islamic Republic support the development of these so-called martyrdom brigades, their structure and activities suggest their purpose is not only to serve as a strategic asset in either deterring or striking at the West, but also to derail domestic attempts to dilute the Islamic Republic's revolutionary legacy. Such strategy is apparent in the work of the Doctrinal Analysis Center for Security without Borders (Markaz-e barresiha-ye doktrinyal-e amniyat bedun marz), an Islamic Revolutionary Guard Corps think tank. Its director, Hassan Abbasi, has embraced the utility of suicide terrorism. On February 19, 2006, he keynoted a Khajeh-Nasir University seminar celebrating the anniversary of Ayatollah Ruhollah Khomeini's fatwa (religious edict) calling for the murder of British author Salman Rushdie. As Khomeini often did, Abbasi began his lecture with literary criticism. He analyzed a U.S. publication from 2004 that, according to Abbasi, "depicts the prophet of Islam as the prophet of blood and violence." Rhetorically, he asked, "Will the Western man be able to understand martyrdom with such prejudice? [Can he] interpret Islam as anything but terrorism?" The West sees suicide bombings as terrorism but, to Abbasi, they are a noble expression of Islam. So what is terrorism if not suicide bombing? To Abbasi, terrorism includes any speech and expression he deems insulting to Islam. According to press coverage of his lecture, Abbasi noted that "[German chancellor] Merkel and [U.S. president] Bush's support of the Danish newspaper, which insults Islam's prophet, has damaged their reputation in the Islamic world and has raised the question of whether Christianity, rather than Islam, is of terrorist nature." From the Iranian leadership's perspective, therefore, Jyllands-Posten's cartoons are evidence of Christian terrorism. By Abbasi's definition, Iran may not sponsor terrorism, but it does not hesitate to promote suicide attacks. He announced that approximately 40,000 Iranian estesh-hadiyun (martyrdom-seekers) were ready to carry out suicide operations against "twenty-nine identified Western targets" should the U.S. military strike Iranian nuclear installations. Such threats are not new. According to an interview with Iran's Fars News Agency released on Abbasi's weblog, he has propagated haras-e moghaddas (sacred terror) at least since 2004. "The front of unbelief," Abbasi wrote, "is the front of the enemies of God and Muslims. Any deed which might instigate terror and horror among them is sacred and honorable." That is radical Islam. And this is who pays for it. I know for sure that you, Oh America will go under; I know for sure that you, Oh Europe will go under; I know for sure that you, Oh Holland, will go under; I know for sure that you, Oh Hirsi Ali, will go under; I know for sure that you, Oh unbelieving fundamentalist, will go under.